Polystyrene & Expanded Polystyrene Market size was over USD 35 billion in 2017, with projected gains close to 4.5% CAGR between 2018 and 2025. Global polystyrene & expanded polystyrene market is estimated to observe significant potential for geofoam applications in the coming decade. Geofoam is expanded polystyrene or extruded polystyrene manufactured into large lightweight blocks. EPS geofoam is approximately 1% the weight of soil and less than 10% the weight of other lightweight fill alternatives. As an ultra-lightweight fill, EPS geofoam reduces the stress on adjacent and underlying subgrades; as an ideal insulator, it prevents heat from reaching the pavement from the underlying soil. On account of these unique characteristics, global PS & EPS market will also mark demand for expanded polystyrene foam in swimming pool construction, as a layer of insulation for roofs and rooftop gardens and for stadium seating. For instance, EPS geofoam has been used to shape the vegetative roof installations at Scottish Parliament building in Scotland. The lightweight and versatile characteristics of EPS geofoam will drive its demand for insulation in green roof systems by 2025. PS & EPS have been used in various electronics applications, for instance, the manufacture of capacitors, refrigerators, ovens, microwaves, vacuum cleaners, televisions, handheld devices, and IT and telecom equipment. 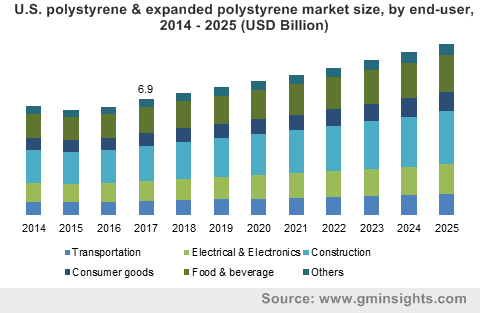 With an increasing demand for smartly designed electrical appliances entailing enhanced functionalities by the global consumer, polystyrene & expanded polystyrene market will mark significant demand in electrical & electronics sector by 2025. 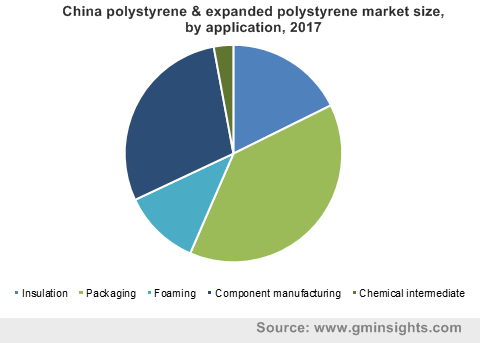 However, volatility in prices of raw materials and availability of high-performance substitutes including polyethylene, polypropylene, PLA, PET and bio-plastics might hamper global PS & EPS market growth to some extent over the forecast period. Polystyrene led global polystyrene & expanded polystyrene market in 2017 and accounted for more than half of the total market share. The product has been used in refrigerator lining, packaging and construction industry. It is lightweight, cost effective and can be recycled conveniently. Its shatterproof characteristics and low conductivity makes polystyrene highly desirable in electrical insulation. Moreover, growing demand for disposable and reusable containers in food industry shall fuel product usage for packaging applications by 2025. EPS is 98% air and the rest is composed of small, spherical EPS beads—made only of hydrogen and carbon. EPS has been the second-largest styrene derivative, after polystyrene. EPS is characterized by properties such as: rigidity, light weight and ideal thermal insulation. The segment shall witness substantial growth in the coming years, expanding at a CAGR of 4.6% due to its 100% recyclability, lightweight and compressive resistance. EPS applications will be significantly demanded in safety wear manufacturing such as helmets, as it provides superior shock resistance along with long time durability. Packaging emerged as the leading application in the polystyrene & EPS market, accounting for over 30% share in 2017. PS and EPS are widely used in packaging of food, electronic appliances, retail items and consumer goods. They are preferred in packaging as it is light in weight and offers excellent insulation and weather resistance properties. However, the segment will observe moderate growth by 2025 due to increase in relative market share of other applications and several bans on plastic usage in food packaging application due to environmental issues. Plastics have been extensively preferred over metals in automobiles in the recent years on account of easy moldability, superior impact strength, improved aesthetics, cabin insulation, scratch resistance and lightweight. An average car includes approximately 10-15% plastics of total car weight. All polystyrene & EPS components play a critical role in automobile manufacturing. The products can be found in a range of applications in this industry including: seating components, front and rear bumper cores, void fillers, roof liners, padding, housing brackets, head impact protection (head rests), side impact protection, pedestrian impact protection, knee bolsters or steering column hoods, boot spacers, sun visors, trunk liners, battery housing. The transportation sector is estimated to have a growth above 4% CAGR in global PS & EPS market by 2025. In 2017, Asia Pacific held the highest share above 40% in global polystyrene & expanded polystyrene market. The region will observe similar trend in the coming years. In the same year, China had a robust share above 50% in the region, for the vast production capacities availability raw materials and robust industrialization, cost-effective manufacturing and the immense growth trends in the sectors including: consumer goods, transportation, electrical & electronics and construction are expected to support the regional growth. 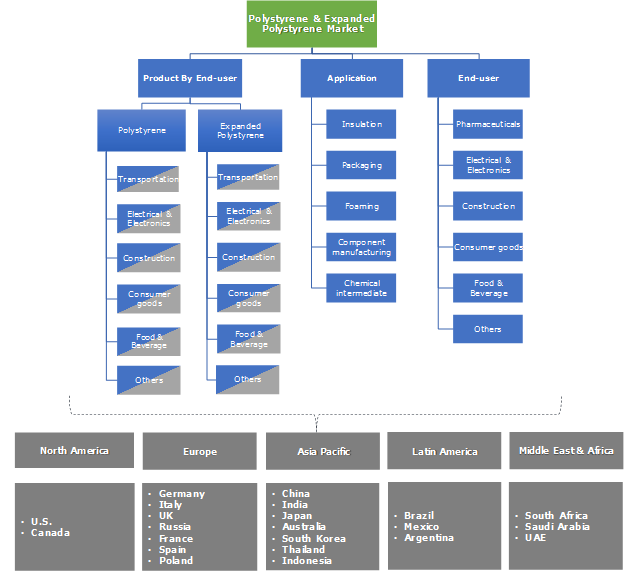 Significant market players in global PS & EPS market include: INEOS Styrolution Group GmbH, Total S.A., Trinseo S.A., BASF SE, SABIC, SIBUR, HIRSCH Servo Ag, ACH Foam Technologies Inc., Flint Hills Resources, etc. Global polystyrene & expanded polystyrene market was highly competitive in 2017. Manufacturers have been involved in significant merger & acquisition activities, for instance, in March 2015, BASF sold its white EPS business in North & Latin America to Alpek S.A.B. de C.V, with the aim to focus on company’s EPS business in Asia and Europe regions. Polystyrene is a synthetic aromatic polymer obtained from styrene monomer. This thermoplastic polymer softens on heating and thus can be converted into semi-finished products including: sheets, films and finished articles. PS is used in IT equipment, electronic components, appliances structures, plastic toys, media and other enclosures. Expanded Polystyrene is a rigid plastic and contains an expansion agent. It is 100% recyclable with unique properties including prevention of microorganism growth and superior thermal insulation. These traits will lead to significant demand for EPS especially in food packaging and construction applications by 2025.